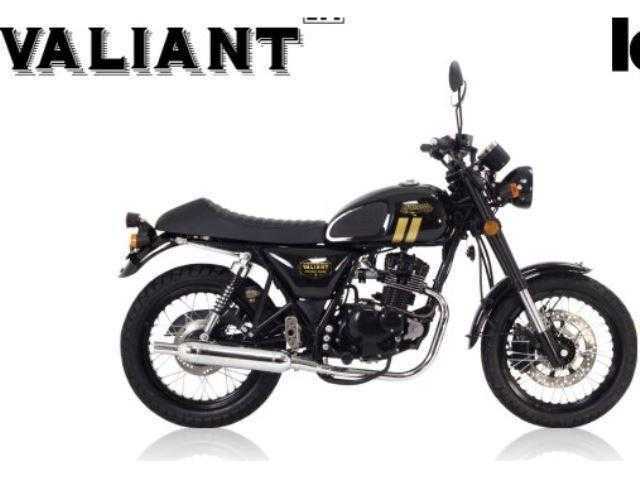 VALIANT 125, Available in Black or White, £2095 â€œOn The Roadâ€ inc Road Tax,etc. Please contact us for a full personal quote over 12 or 24 or 36 months. The Lexmoto Valiant provides a traditional experience that focuses on the heart of riding on two wheels. Now revised as a fuel injected and combined braking model the Valiant has seen a host of changes including USD front suspension, revised rear disc brake, fuel indicator and revised styling whilst still maintaining an awesome price. A smooth 4 stroke motor provides a reliable engine with a sound that is refined through a stainless pea-shooter style exhaust. With classic Cafe racer styling you can turn heads and recreate the nostalgia of British.